Check out our friends who play an integral role in our community. The mission of Austin Child Guidance Center is to improve the mental health of children and their families through early intervention, diagnosis and treatment to help develop the emotional skills to face life’s challenges. 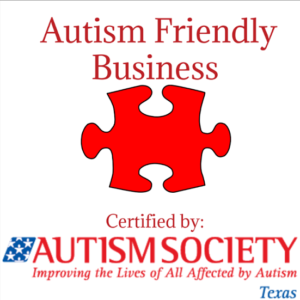 The Autism Society of Texas changes lives by connecting families and individuals to community resources and support throughout Texas. Offerings include support meetings; on-line networking opportunities; Sensory Friendly films; and fun family activities. Increase the reading speed, concentration, and test scores of your child. Capitol School’s mission is to provide an enriched learning environment where children with speech, language, and learning differences can reach their full potential and develop skills necessary to succeed in future educational settings. Most of our students have a diagnosed language/learning difference, and up to 20% of our students are typically-developing children who benefit from our language-rich, small group setting while acting as peer models for language-impaired classmates. This inclusive model benefits both types of students tremendously as curriculum goals focus on language development, which is fundamental for early learning, and are tailored to each child’s individual needs. Find a tutor in Northwest Austin that will launch you on the road to success! With Club Z!, you can find private tutoring in Northwest Austin. We provide an in-home tutor in Northwest Austin in any subject, but what sets Club Z! apart from other tutoring services in Northwest Austin is our flexibility, customization, individualized attention and expertise. For your convenience, our private tutoring in Northwest Austin is flexible enough to meet your scheduling needs, regardless of how busy you are. Also, your Club Z! in-home tutor in Northwest Austin will travel to your house, so you don’t have to waste time commuting. College Living Experience (CLE) is the industry’s leading provider of post-secondary supports for young adults with learning differences. Dedicated to providing the highest quality of services, we strive to propel young adults toward success as they journey through their transition to independence. CLE students pursue their academic program or career of interest while also receiving services across the domains of independent living and social skill development. Down Home Ranch is a 410 acre working farm and ranch east of Austin, Texas, where 46 men and women with Down syndrome and other disabilities live with friends who work beside them. We raise cattle, chickens, and an occasional pig or two to feed ourselves along with flowers and vegetables in our greenhouses and gardens. We mind our own business best we can. Come see us if you’re in the neighborhood, and we’ll show you around. Someone’s most always home. Our passion comes from seeing our clients succeed. From a single video project to a full-service content marketing collaboration, our team is excited to help amplify your marketing and get your message in motion! The awesome team at Golden Arm Media conducted our fantastic, inagural filmmaking workshop in January 2017, and our second filmmaking workshop is scheduled for April 22. Participants in the workshop will create a film, followed by a film screening at the end of the workshop for friends and family. Kwaddle and Joshua’s Stage are proud partners helping Austin area families. Kwaddle is a new, local startup that helps parents in Austin find the best summer camps, activities and classes for children. We have the largest collection of summer camps and classes for kids. Over 500 businesses are listed and over 2,000 different activities, camps and family-friendly events are listed on Kwaddle.com. We send out weekly newsletters to our users to tell them about all kinds of events and organizations in Central Texas that are doing great work for children and families. Our goal is to get you noticed and keep you in the public eye. We represent small Austin-based businesses. All our clients have different needs regarding press coverage. We will work to determine your unique story and find interesting, relevant press angles. Joshua’s Stage is excited to collaborate with Move Your Tale, which strives to provide a participatory, collaborative performing arts experience and the opportunity to create, communicate and entertain. Our Improv session and summer camp for grades 6-8 is conducted at Move Your Tale, ColdTowne Theater, 4803 Airport Blvd., Austin, TX 78751. Nothing is more important to parents than their relationships with their children…and yet, these relationships can also be challenging and conflictual at times. I offer compassionate, collaborative consultation around a variety of issues concerning this most powerful relationship. I am not the expert when it comes to your child – YOU are. Together, drawing on my years of experience as a licensed psychologist (and licensed specialist in school psychology), educator, and mother, we can work together to support the goals you have in creating the family relationships you desire. Our mission at Neuronutrition Associates is to deliver outstanding functional and integrative pediatric medical care and provide support to families in raising healthy, happy children. From prevention to treatment, we use both traditional and holistic systems of medicine, a variety of services and unique vantage points to create comprehensive individualized treatment plans for each patient. We have extensive experience solving complex pediatric cases using the most current laboratory testing and nutraceutical treatments. Our practitioners are also trained in traditional medicine, so our patients get the best of both worlds. Odyssey School is committed to the development of academic excellence and self-acceptance for students who struggle in traditional educational settings. We believe that all children can be successful in their intellectual, creative, and social development. Our goal is to help every student discover their individual potential for greatness. We’re delighted to invite you to explore our extraordinary middle and high school, where students with learning differences thrive. Our staff is dedicated to supporting every student, and we are always honored to meet new families. Please consider us a resource in the search to discover the best educational path. We consider every applicant to our school as unique and important, and we’d love to help you find the right learning environment for your child. Now, more than ever before, fitness and fun needs to be introduced to today’s youth. In a society that can tend to focus more on iPads than play, it’s important that our future generations continue to realize the value of a healthy, active lifestyle, and learn that they already have the right tools and resources to carry that value with them through life – We believe there is no better place to learn just that, no matter what age you are, than at The Fitness School. Thinkery is an evolution of Austin Children’s Museum. It’s Austin’s home for “why” and “how.” A place where science and families play side by side. Where people connect with ideas by doing, making and experiencing. It’s a foundry for a new generation of innovators and creative problem solvers. And it’s a heck of a good time. The Toybrary is a toy lending library and kids’ birthday party venue that also offers drop-in childcare in Austin, TX. A toy library operates much like a book library, only the items available for loan are toys, making it possible for parents to offer their children age-appropriate toys at each developmental stage without having to spend a lot of money or have a ton of storage space. We have over 1200 toys available for checkout, so come check us out! Hi, this is Ryan France . . . with a history as an athlete and most recently a background as a real estate broker/owner, folks are often curious about my motives behind diving head on into the world of digital media—as Host of the Voices of Impact podcast. The answer is simple really. I am fascinated by the art of storytelling. If I had my druthers and no other pressing responsibilities, I’d be perfectly happy driving around and listening or walking and listening to podcasts all day long. I am an unabashed and fully certified ‘podcast-junkie.’ I’m amazed by the wealth of valuable information we all have available to us – for free – with just a few taps and a couple swipes of the finger. In my eyes, podcasts are a goldmine. But, admittedly, that is my own selfish fascination with starting the show. The true purpose is this: Voices of Impact is an initiative dedicated to amplifying the voices of honest, hardworking, business owners, entrepreneurs, leaders and community organizers. People, just like you and me, who are admittedly imperfect, but who have soul. People who have ‘Do Good Things’ baked into their DNA. In other words, it’s a platform built to spotlight people on a mission to make an impact in their and for their communities. William’s Community School is built on the strong philosophical belief that, given the right supports, every child can thrive. We are committed to ensuring a challenging and accepting educational environment with a strong emphasis on building lasting relationships. We provide a sense of safety, community and family to students and parents by fostering and developing a successful partnership. At William’s Community School, we encourage students to develop caring attitudes and respect towards themselves, other children, adults, their school and their environment. We recognize each child’s individuality and provide differentiated teaching to meet individual needs and capitalize on unique learning styles. We offer a broad, balanced, appropriate curriculum that encourages optimal social, emotional, and academic development. Our classrooms and facility grounds provide a peaceful atmosphere to support concentration and encourage an orderly environment. ZACH creates intimate theatre experiences that ignite the imagination, inspire the spirit, and engage the community.